Both Citi and RBC Capital Markets reiterated their buy ratings on Apple and advised clients that more expensive phones are enjoying a warm reception. "While a few days of observation falls short of a definite conclusion, we believe these initial findings will surprise investors to the upside," wrote Citi's Jim Suva. RBC analyst Amit Daryanani believes that this year's carrier promotions appear more attractive than those during the iPhone X cycle. Early results show that customers are excited about the latest iPhone lineup, which should drive higher sales volume and stock gains, according to two top analysts. Both Citigroup and RBC Capital Markets reiterated their buy ratings on Apple over the weekend after seeing just how popular the new phones appear. For Citi analyst Jim Suva, the hundreds of customers flocking to Apple stores over the weekend provided evidence not just of rebounding demand for new phones, but also willingness to pay top dollar for flashier technology. "Wow we did not expect this," Suva wrote. "Yes there were lines, and many Apple stores were serving only the pre-order confirmed orders, while walk-ins were referred to order online or check back in a few days." "While a few days of observation falls short of a definite conclusion, we believe these initial findings will surprise investors to the upside as many expected the new devices to have widely expected features, minimal improvements, and a lukewarm reception," he added. Amid his key findings, Suva said the majority of customers the Citi team spoke with actually opted for the high-end iPhone XS Max with 512 GB of memory. "The high cost of the model is reasonable for someone who uses the devices several times each day, and the device is a form of both entertainment and work productivity," the analyst wrote. The newest generation of phones under CEO Tim Cook showcase a number of refinements from their iPhone X predecessors. While all three phones include popular features like facial recognition and wireless charging, many electing to upgrade have highlighted larger screens and the improved memory. The XS Max, for example, boasts a 6.5-inch display, making it larger than Samsung's Galaxy Note 9, which has a 6.4-inch screen. Suva's price target of $230 represents more than 5 percent upside from Friday's close of $217.66. RBC analyst Amit Daryanani, meanwhile, believes that this year's carrier promotions appear more attractive than those during the iPhone X cycle, spelling healthy sales growth in the months to come. "We think this could result in a healthy cycle from a volume standpoint even as average selling prices go up from already high comps," Daryanani wrote Sunday. "Promotions like $700-off on a new line at multiple carriers, along with better trade-in values vs last year imply that higher pricing of iPhone XS Max would be less of a hurdle for buyers." That compares with offers during the iPhone X cycle such as Verizon offering $300 off an iPhone 8 if customers trade in their older phones. In sum, the analyst said Apple is positioned for mid-single-digit sales and low-to-mid teens earnings per share growth despite relatively flat iPhone volume growth. Daryanani's $240 target implies more than 10 percent upside from Friday's close. 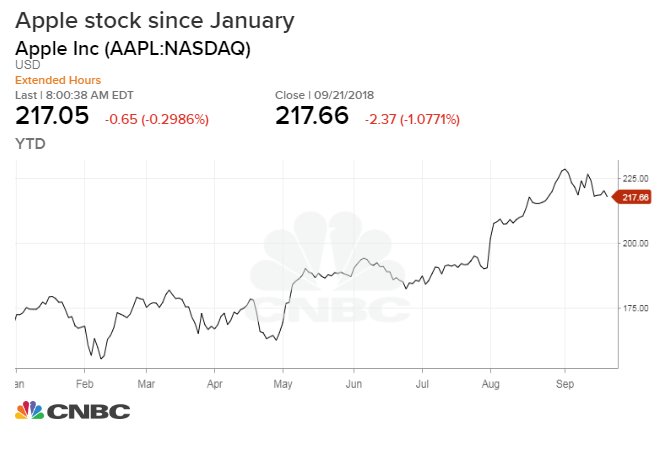 Though Apple slipped 0.4 percent in premarket trading Monday, the stock is up nearly 32 percent over the past six months.